Emergency crews worked for hours to douse a fire that devoured significant portions of Notre-Dame Cathedral in Paris and some Montrealers are looking on in shock. 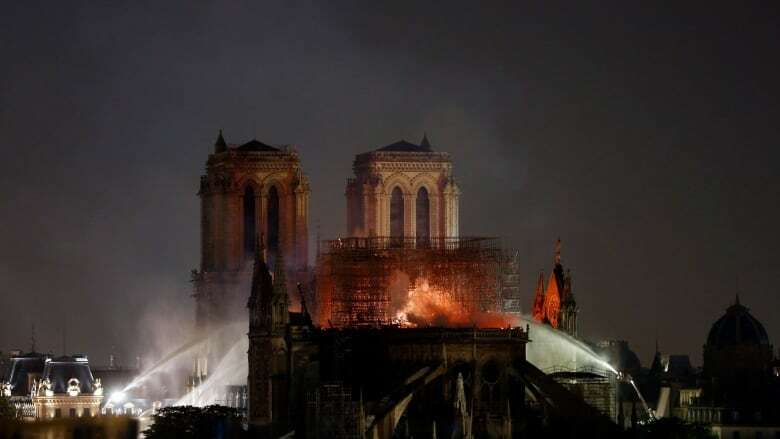 Quebec Premier François Legault tweeted his condolences, saying "Notre-Dame Cathedral in Paris is a gem! My thoughts are with Parisians today and the firefighters who fight the flames." Les terribles images qui nous proviennent de Paris me touchent profondément. Notre-Dame de Paris est un joyau! <br><br>J’ai une pensée pour les Parisiens aujourd’hui et pour les pompiers qui combattent les flammes. Montreal Mayor Valérie Plante said the building is "part of our collective history — literature, cultural and religious." Later in the day, she said she saw "massive billows of smoke, all different colours," and found out the basilica was burning. "It's a really sad time in Paris," she said. As a tourist, the structure represents a piece of history to her. She said she would want to go to the site tomorrow to honour its memory, but isn't sure the area will be reopened to the public then. In the streets, people are "super silent," said Franck Pierron, a former Montrealer who lives in Paris. "I've never seen that before," he said. Montreal's Museum of Fine Arts posted a painting of the basilica from its collection to its Instagram page with a broken heart emoji as the caption. "There are a lot of art works inside … it's a real tragedy," Paris Mayor Anne Hidalgo told reporters at the scene.